Vice Adm. Rick Snyder is an honor graduate of Tulane University, with a Bachelor of Science in Management. Upon graduation, he was commissioned in the Navy through Tulane Navy Reserve Officer Training Corps Program. In November 1984, Snyder was designated a Naval Aviator. Following initial training in the SH-60B Sea Hawk helicopter, Snyder served at Helicopter Anti-Submarine Squadron Light (HSL) 43, based in North Island, California. Subsequent flying tours included duties as an instructor pilot at HSL-40 and as a department head at HSL-46 in Mayport, Florida. Snyder also served at sea as the USS Carl Vinson (CVN-70) navigator. Shore tours included attendance at the Naval Postgraduate School in Monterey, California, where he earned a Master of Science in Operations Research and a follow-on tour as the Navy operations analyst for the Republic of Korea/U.S. Combined Forces Command in Seoul, Korea. In Washington, D.C., Snyder served the Secretary of Defense as aviation liaison for public affairs, and he was a senior fellow at the Atlantic Council of the United States. Snyder was also a senior fellow in the Chief of Naval Operations Strategic Studies group. Shore flag officer assignments include the joint staff directorate for Strategy and Policy (J5) as deputy director for Joint Strategic Planning and the director of the Navy’s 21st Century Sailor Office, leading efforts to build and sustain resilience for Sailors and their families. Prior to his current assignment, Snyder was the director for Strategy, Plans and Policy (J5) at U.S. Northern Command and North American Aerospace Defense Command. As commanding officer, Snyder led the Sailors and Marines of HSL-46, HSL-40, USS Bataan (LHD-5) and Expeditionary Strike Group 2. 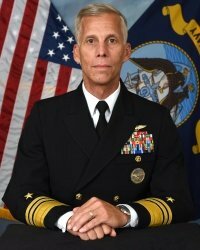 Snyder assumed his duties as the 41st Naval inspector general on August 1, 2018. Personal awards earned by Snyder include the Defense Superior Service Medal (3 awards), Legion of Merit (3 awards), Defense Meritorious Service Medal, Meritorious Service Medal (4 awards) and the Navy/Marine Corps Commendation Medal (3 awards).